From individual masterpieces to arranging them together to form a unique cake, cupcakes have really become popular. Join us to create a wonderful kids birthday resource full of cupcake ideas! We will showcase your submissions here. 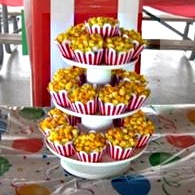 Our goal is to create a large and creative resource to help you plan your kids birthday party. Share your themed or holiday creations, favorite characters, baby, animals, and anything unique! Be sure to include what you used to decorate it with and any tips you think others could use.